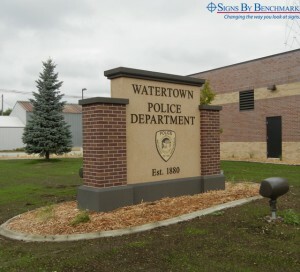 Recently, the Watertown Police Department, located in Signs By Benchmark’s hometown of Watertown S.D., constructed a new facility. 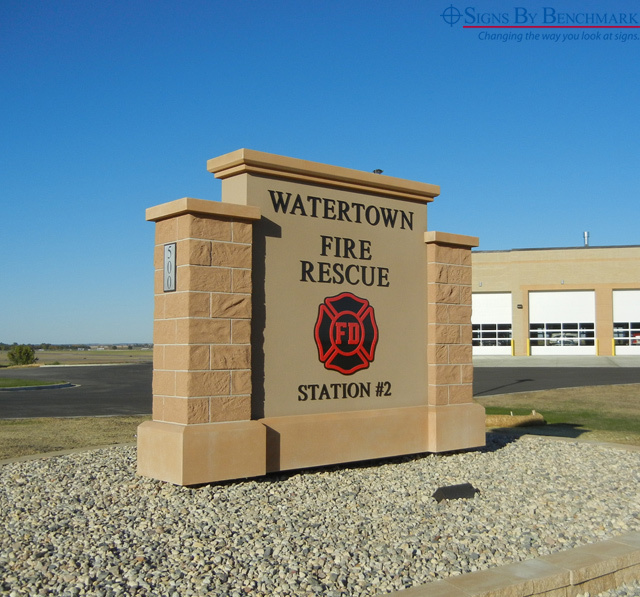 When it came time for new signage to complement the new structure, they chose a custom monument sign created by Signs By Benchmark from a cellular plastic medium. In the early project stages, Signs By Benchmark designers met with the city’s mayor to determine design needs. 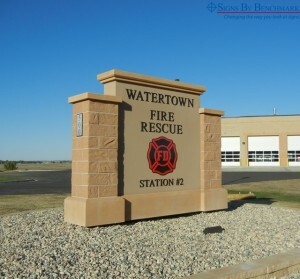 The mayor reminded them of the recently designed fire department sign (also by Signs By Benchmark) and his desire to achieve design continuity among new municipal signage. The specified exterior wall-mounted letters would have only been visible from one direction, so a ground sign was decided on. 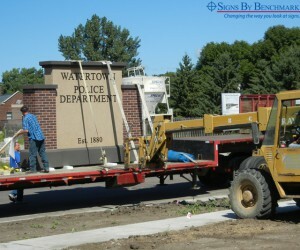 Also considered was the fact that the new police department sign would be installed near the building. The designers immediately focused on matching existing elements such as block, stucco, decorative granite and brick. 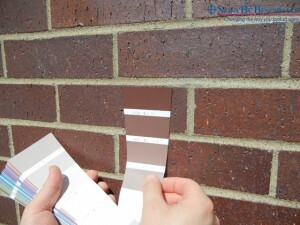 Working with the project architect, the Signs By Benchmark team obtained precise brick and grout measurements. Color matches were made by holding matching paint chips up to the brick under good light conditions while photos were taken with a digital camera capable of producing high quality photos. The stately 12′ 1 1/2″ high x 9′ 2″ wide x 31 1/4″ deep custom monument features a two-color acrylic stucco finish, faux brick and wall-mount Gemini laser cut acrylic lettering. 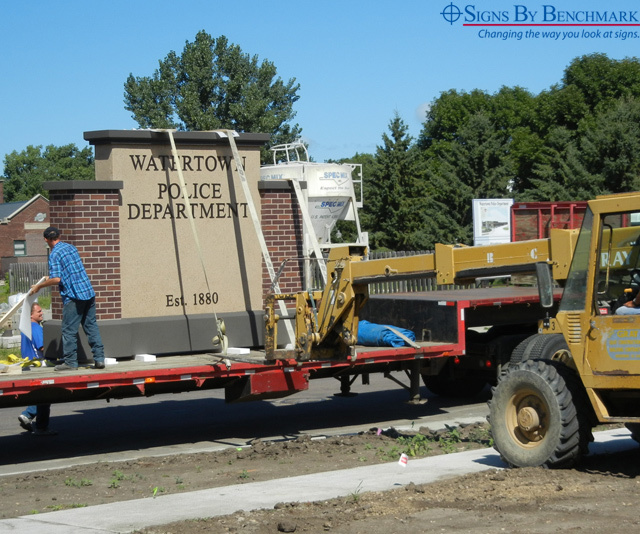 Adding distinction to the sign is a waterjet cut aluminum replica of the official police department patch created by a community citizen with close ties to the department. 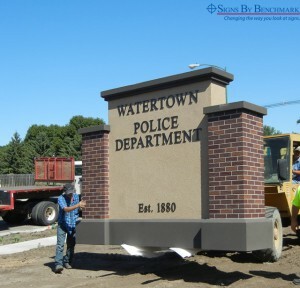 Due to the sign’s lightweight properties, installation was simple. The Signs By Benchmark team looked on, enjoying the opportunity of having created a sign that would remain in their hometown. Over the years, the Signs By Benchmark team has become extremely expert at matching existing elements when creating faux components such as brick. Give them a call today at 800-658-3444 to discuss your upcoming projects. Their experienced knowledge and the flexibility of their cellular plastic medium can help turn your signage ideas into reality.